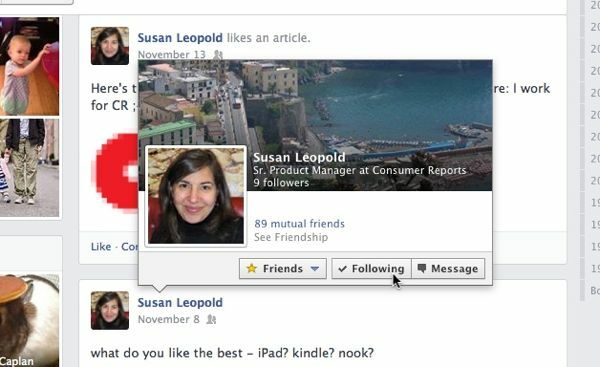 Want to unfollow an annoying Facebook friend (or frenemy’s) unwanted posts out of your news feed? Well, you still can—but (surprise, surprise) there’s now a new way to do it. The old method of removing a friend’s updates from your news feed (which I’ve detailed in the past) was to hover your mouse over their name, click the Friends button in the pop-up window, then uncheck the “Show in News Feed” setting. If you click the Friends button now, though, you’ll notice the Show in News Feed setting is now missing—and next to the Friends button, there’s a new button labelled Following. So, what’s the Following button for? If it’s checked, it means you’ll see that particular friend’s posts in your news feed. Don’t want to see the friend’s updates anymore? Click the Following button, then select “Unfollow [name of friend].” Once that’s done, you will have essentially “unfollowed” your friend’s Facebook posts. Change your mind? Click the button (which, once unchecked, is re-labeled “Follow”) again to get your pal’s updates back in your news feed.